How PeopleSoft Single Signon Works? 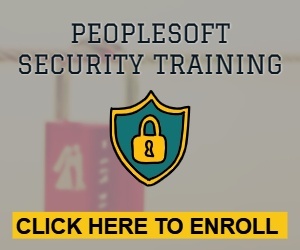 In this post, we will discuss about ‘PeopleSoft Only’ Single Signon Implementation and how 2 PeopleSoft applications participate in a Single Signon Setup. 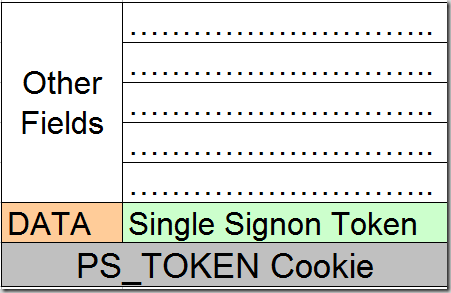 Before we start with the functionality and setup of Single Signon, we should learn a little bit about PS_TOKEN cookie. PS_TOKEN is a cookie which is embedded into the browser memory of a user authenticated by the PeopleSoft Web Server. As long as cookie is active, user can browse that PeopleSoft Application without entering login details again. Note: If cookies are disabled in your browser, user won’t be able to get into PeopleSoft Application. How is PS_TOKEN cookie generated? Single Signon Token generated by Application Server contains user id, language code, date and time when issued , issuing system and the signature. Signature is created after encrypting the combination of first 4 values and local node password. After receiving Single Signon Token from the application server, PeopleSoft Web server generates the PS_TOKEN cookie and then inserts it into user’s browser memory. 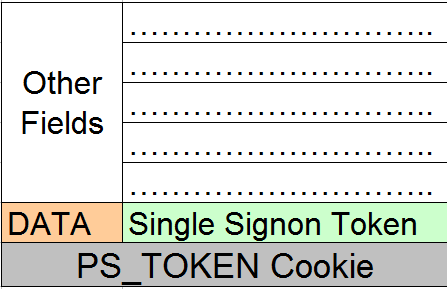 Data value of the PS_TOKEN cookie contains the Single Signon Token generated by the Application Server. PS_TOKEN cookie remains in the user’s browser until the session expires. How Secure is PS_TOKEN Cookie? PS_TOKEN cookie authentication is considered to be very secure and has few security features. There are few security concerns related to encryption and non-standard algorithm used in generating PS_COOKIE which may lead a hacker to forge PS_TOKEN. You can read more about it in this article. How PeopleSoft Only Single Signon Works? Now that you understand the generation of PS_TOKEN cookie, lets focus on Single Signon process between 2 PeopleSoft Applications. Consider 2 applications to be HCM and FSCM where user first logged into HCM (which will generate PS_TOKEN). Browser sends the PS_TOKEN cookie(generated by HCM) to FSCM Web Server. FSCM Webserver sees signon token and doesn’t display sign in page , instead it sends the DATA field of PS_TOKEN cookie to FSCM application server for authentication and validation. FSCM application server performs the validation checks on DATA field of PS_TOKEN cookie. Check 1: Is forwarding node trusted ? – Issuing system value in the DATA field should be a trusted node in FSCM application with an entry in PSTRUSTNODES table. Check 2: Has Token Expired? – Checks Issued Date and Time Value to see if the token has expired. Expiration value set in FSCM is checked instead of value set by HCM application. If HCM has a expiration value of 40 minutes and FSCM has a expiration value of 20 minutes, then value set under FSCM (20) is considered for this validation check. Check 3: Signature Tampered? – Using the info in the token, FSCM app server generates a signature and then matches it with the signature present in the token. Both needs to be a perfect match. After all the validation checks are passed, FSCM application server provides the information requested by the user.